If you have been on the lookout for the best spice grinder for your cooking needs, we understand that it might be a little bit overwhelming to choose which one. Today’s market offers a wide variety of spice and herb grinders. There is something for everything, but not every spice grinder provides the same functionality or ease of use. Freshly ground spices and herbs give your dishes a burst of piquant flavor that pre-ground spices can't match. Much of how we perceive the taste of food comes from its aroma. And although many spices have a relatively long shelf life, they don't retain that aroma when they sit on the shelf for months (or even years). The ability to grind your herbs and spices right before you cook or serve your dishes can elevate everyday cookery to new gourmet heights. Spices have long been considered some of the rarest, most in-demand, and sought-after items in the history of the world. Ancient cultures have flourished or fallen based on their ability to ship and import spices around the world. For as far back as history records, herbs and spices have been used by every culture for everything from food preparation and preservation to medicine and magic. Spices were originally ground with rocks and later in a mortar and pestle to make them easier to measure and store. 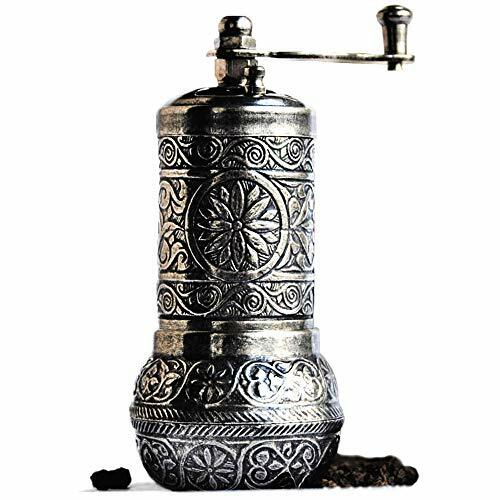 It wasn’t that long ago that owning the best spice grinder, or any spice grinder, was considered a luxury and an item you would seldom, if ever, use. Not only were they rather expensive, but most people rarely had occasion to use them. The idea of having one of your own seemed like a waste of money. These days, an increasing number of people are growing their herbs and spices rather than buying pre-ground, bottled spices from a grocery store. Some people grow them in yard gardens, vertical gardens on a porch, and even in small pots right in their kitchens. Many cooks also buy them whole, bagged, and unprocessed. This helps to keep the quality high and the price low. Many of you already grind your pepper on the spot because you realize that it makes it taste fresher and more flavorful. This occurs because pre-ground pepper loses some of its aroma and flavor after contact with the air. The same principle applies to all other spices and herbs, as well. To help you avoid poorly made or just plain inferior grinders, we have compiled this list. In it, we hope to show you some of the most reliable, proven quality, and highly recommended spice and herb grinders on the market today. (See, when we say "best spice grinder," we mean it!) To do this, we have collected data on sales and customer satisfaction from outlets such as Amazon, Walmart, and others. We've researched each item on the site of the manufacturer, and checked with sources such as Good Housekeeping, Consumer Reports, and quality inspection organizations. With this list, we hope to give you an idea of what to look for and what to avoid when purchasing a grinder. You may see a brand or style you have been previously unaware of that strikes your fancy. We will not only point out positive features, but we will also make note of when and where they may have fallen short. With that in mind, here are our picks for the best spice grinders of 2018. Electric grinders are easier to use and generally hold considerably more product that hand or mill grinders. They have very sharp, quickly rotating, motor-driven blades and usually have a safety switch that will not allow the motor to engage if the lid is open. Emerging as a leader in new coffee technology, the Krups company has been around for about 150 years. Their F203, with stainless steel blades, shines as one of the best spice grinders as well as one of the best for coffee. Affordable and reliable, it has all the bells and whistles you will ever need to process your herbs and spices, as well as your coffee beans. The Krups F203 will grind nuts, seeds, and herbs, as well as coffee beans and spices. Along with the easy “Fast Touch” operation, customers lauded the lid-activated safety switch, which prevents injuries by not allowing the grinder to activate until the lid shuts securely. They also made a note of its compact design that uses a minimum of counter space and the convenient retractable cord. Others commented that it was usable out of the box and required little or no preparation. On the downside, some customers noted that it tended to get rather hot with extended use and could scorch the contents. One customer pointed out that it was somewhat difficult to clean completely. 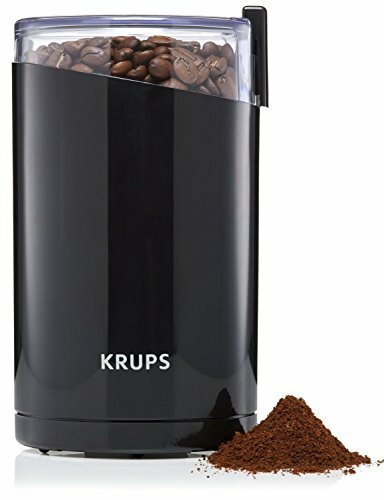 The Krups F203 Electric Spice and Coffee Grinder was rated four out of five stars on Amazon and was found online at prices ranging from $$ to $$. A multipurpose one-touch electric grinder, the Quiseen One-Touch does an excellent job grinding coffee beans, herbs, spices, nuts, and even grains. It is tough enough to use every day because of its rugged motor and sharp stainless-steel blades. As you can see from the picture, it comes with sure-grip bumps on the surface that prevent it from slipping out of your hands if they are slick from cooking. As with most electric grinders, customers were pleased with the safety lock. They liked the clear lid that allows you to watch your grinding but were not happy with what some called inconsistent grinding results. Customers also appreciated the simple and elegant overall design. The large print manual, as well as the ease of cleaning, were also a hit with customers helping this make the best spice grinder list. The Quiseen One-Touch measures 7.8 by 4.6 by 4.5 inches, and online pricing ranges from $$ to $$ online. It holds a very respectable rating by customers on Amazon of 4.3 out of 5 stars. One of the least expensive yet most reliable electric grinders on the market is the Epica electric. It has two stainless steel blades and a see-through lid for monitoring the progress of your grind. Designed with a very quiet motor for those of you who would be grinding coffee before anyone else is awake, the blades are also very quiet when operating. Some reviewing customers made positive comments about the detachable grinding cup that allows the Epica to let you pour out the contents easily and without a mess. They also noted the safety lock lid that prevents injuries and the anti-skid base that keeps it in place as excellent features. Although most of the comments were positive, some customers were unhappy that it doesn't run for more than 20 seconds. 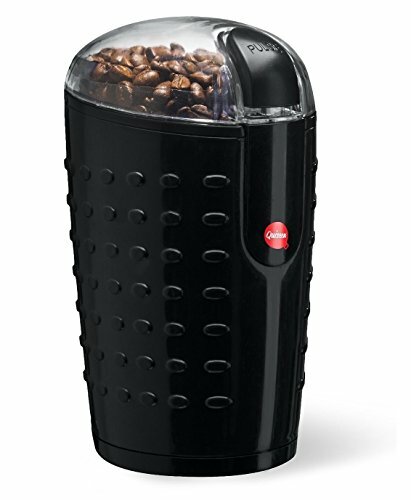 Designed with a heavy-duty 250-watt grinding motor and an easy-press activation button, the Epica Electric comes with 17 individual grinder settings. It has a capacity of 2.5 ounces, and the blades and cup are both dishwasher safe. At just 3.5 inches in diameter, it is small enough to fit on almost any kitchen counter easily and can be found online at prices from $$ to $$. It carries an Amazon rating of an impressive 4.5 out of 5 stars. Boasting of two detachable stainless-steel bowls (a grinding bowl and a chopping bowl), the Secura electric grinder will not only grind spices, herbs, and coffee beans but also chop vegetables. It comes with an overheating prevention monitor that shuts down the unit should the motor heat beyond a certain temperature. This is an excellent idea for ensuring long motor life. 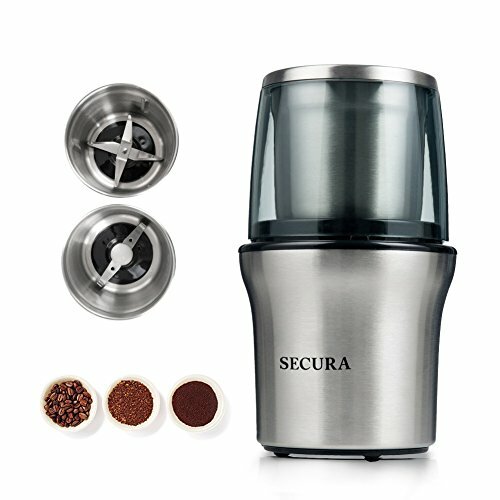 The Secura also has a sturdy stainless-steel body that adds to the stability and longevity of this grinder. Customers have mentioned that they like the full 2-year warranty and have also noted the excellent customer support from Secura. Positive comments praised the removable bowls and quick-stop safety switch. Buyers also appreciate that spare parts are available in case you need to replace something minor after the warranty expires. The Secura measures 9.9 by 5.4 by 5.4 inches and only weighs 2.6 pounds. It has an Amazon rating of 4.1 out of 5 stars and prices on the internet range from $$ to $. There are several types of manual grinders on the market. Hand grinders usually consist of two or more sections that fit together to form a tube. The twisting of this tube causes the inner teeth to grind through your product. Another form of hand grinders includes spice mills, which utilize a hand crank to move the grinding mechanism. It doesn't have to be electric to make our best spice grinder listing, it just has to be a great grinder and reliable. 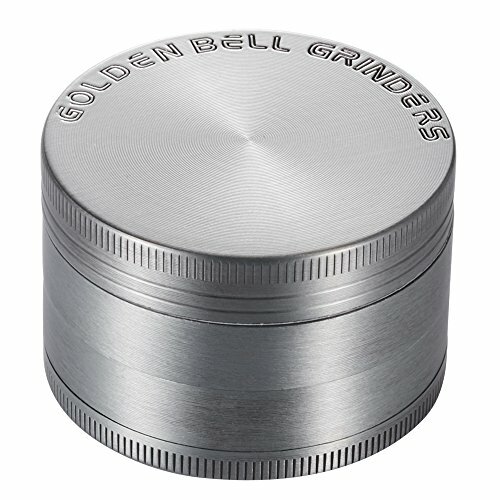 The Golden Bell four-piece spice and herb grinder, made of sturdy zinc allow, has two separate chambers. The first two pieces make up the first chamber. It contains the sharp, diamond-shaped teeth that do the actual grinding of your herbs and spices. All you have to do is twist the unit, and the diamond teeth do the rest. The third piece consists of the mesh screen and middle chamber that filter all but the very finest particles. The fourth piece, on the bottom, collects whatever you have ground. It works in just seconds and comes in eight colors. A thin poly O-ring cuts down friction and makes the process of hand twisting much easier. Customers have cited the magnetized lid as a plus feature that helps prevent inadvertent spillage. They also commented that it was easy to maintain and conveniently portable. Another bonus includes the lifetime warranty and the full, money-back guarantee as selling points. Other buyers seemed disappointed that it was not as effective on seeds and kernels as they'd hoped. The Golden Bell grinder allows for precise fineness or coarseness depending on the length of the grind. Stylish and compact, it is 2 by 2 by 1.1 inches and weighs just 4 ounces. If you are looking for a compact and stylish grinder that both works and travels well, the Golden Bell model could be the one for you. It can be found online costing between $ and $$ and boasts an excellent Amazon rating of 4.5 out of 5 stars. Certainly one of the most interesting and display-worthy, the Bazaar Anatolia mill, designed to grind all kinds of spices, will also add an old-world decorative touch to your kitchen. It is built to grind salt, pepper, rice, cumin, mustard, coriander, cardamom, and sumac. Don’t let the intricate and attractive design fool you. The Bazaar Anatolia was made for heavy-duty work and is very sturdy. The Bizarre Anatolia model, unlike most other grinders on this list, was designed to be used directly over food, plates, or pots, as well as with the included and attached bowl. Constructed of high-grade cast iron, this unit is available in six rustic-looking colors. Consumers appreciated that there are no plastic parts to break and that it fits any décor. They were also pleased with the modest price. Available online for anywhere from $ to $$, it has an Amazon rating of 4 out of 5 stars. Combining the best features of hand and mill grinders, this widely available spice grinder makes our list based on popularity with customers and reviewers alike. 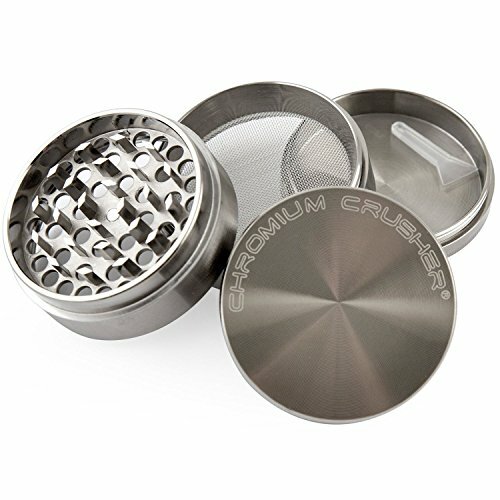 The Chromium Crusher grinder rates as one of the best of its kind that we have ever seen. Another small grinder constructed of heavy-duty zinc alloy, it has a clear top and an easy-on-the-hands mill handle. When assembled, it makes an interesting and attractive addition to your kitchen décor. Customers consistently praised the Chromium Crusher for its style, magnetic lid, fine mesh screen, and extremely fine product results. One particular customer that suffers hand pain was particularly keen on how little effort was necessary to use the device properly. Some negative responses included some pieces becoming stuck in the blades and, of course, the smallish amount you could grind at a time. The Chromium Crusher measures 2.2 inches in diameter and 1.75 inches high. It has an Amazon customer rating of 4.4 out of 5 stars and includes a limited lifetime warranty. You can find it online priced from $ to $$. You'll find another class of spice grinder that works outstandingly in its own right. 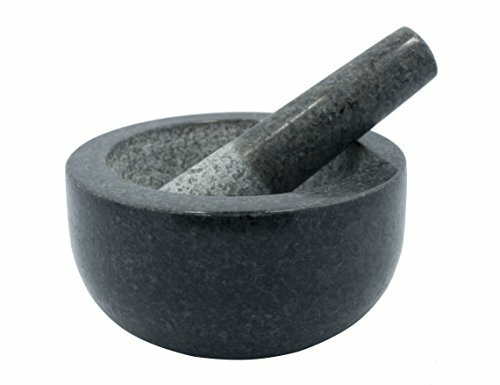 Featuring simplicity and ease of use, a finely made mortar and pestle is the best spice grinder for traditionalists. They do an excellent job of powdering your spices and will look good on your shelf when you have finished. For those of you who want to grind your spice in a more hands-on way, the Kota natural stone granite mortar and pestle is a more traditional, beautiful, and delightful way to grind your spices and herbs. It adds a splash of style to your kitchen when on display in your home. 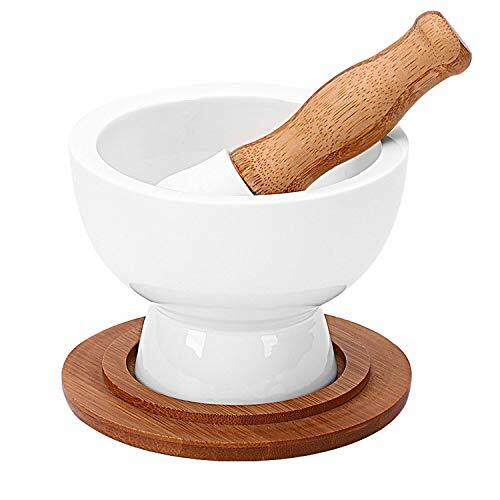 Used for centuries to grind herbs, spices, seeds, and nuts, the mortar and pestle is just as effective in 2018 CE as it was in 2018 BC. It gives a tactile satisfaction that you can’t get from pushing a button. The natural non-porous, solid igneous black granite will serve you well with both wet and dry ingredients. It doesn’t absorb juice or oil, and it is simple to wash and dry. It weighs in at a hefty 8 pounds. The mortar measures 5.25 by 5.25 inches; the pestle measures 6.75 wide by 1.75 inches high. The bowl interior measures 3.75 by 2.75 inches deep in the center. As can be expected, customers loved the simplistic beauty of the high-quality black granite and also appreciated the unconditional lifetime warranty. It has an Amazon customer rating of 4.7 out of 5 stars and sells online from $$ to $$. 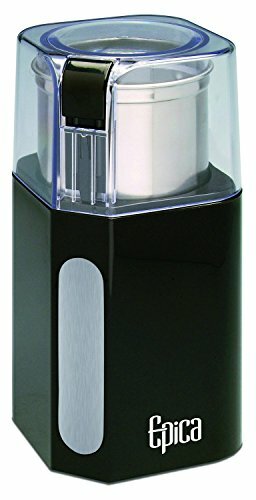 Making usable powder or shredding your spices and other products always begins by selecting the best spice grinder for your purpose. Hopefully, this process has been made easier with this list that summarizes the top products available in various styles and types. Some grinders are large and rugged, some are portable and lightweight, and others are unusual but effective. With proper handling and care, all of these grinders should serve you well for years to come. They will turn your spices, herbs, nuts, salt, coffee, and other products into a fine powder for easier measurement and much more flavor. What do you consider the best spice grinder on this list? Have you used any of these, or have a go-to brand we missed? Let us know down in the comments!